Jean Phillips knows how to adapt. Twelve year ago, when making a living from dairying got too tough, the Germantown, Md., farmer jumped full-time into selling straw and hay to construction companies. But builders didn't buy much of her product in July and August. "There were always six weeks where we didn't do any business." she days. So she started raising sweet corn "to make it through the dry period. We already had a crew of people hired, and nothing to do that time of year." Since her first foray into vegetable production, Jean and her son Russell have branched out into raising 15 varieties of sweet corn-as well as popcorn, Indian corn and field corn-tomatoes, cucumbers, cantaloupe, watermelon, peppers, pumpkins and squash. "January and February are pretty calm for us," she says. But the rest of the year, starting in March when she raises the transplants for vegetable seedlings, is full speed ahead. In fact, vegetables keep her so busy that Phillips sold the hay production business so she could keep up. About 50 percent of Jean and Russell's total sales are from 140 acres of sweet corn they truck to Giant grocery stores. They also sell much of their tomato crop and some cantaloupe to the large chain. Most of the rest of the produce is sold through their four stands, with the remainder going to farmers' markets and wholesalers. Before approaching Giant three years ago, Phillips was already selling a limited amount of corn to Weis supermarkets. Encouraged with the results, she planted even more corn the next year and approached the produce manager at the local Giant. " I asked if he ever bought any local produce, and the chain was just starting a program to do so. 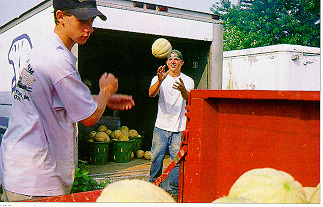 We called the manager, and within a couple of days, he was on the farm and asking us to ship 1,600 dozen that first day." Now, "They have given us an oral agreement that they will take as much corn as we can sell them as long as we keep the quality high. Sometimes the local stores are pretty full and they need us to go to a different region," says Phillips. But "They have never turned down one of our loads. The farthest we've had to ship is down to Warrenton, Va., and that's not bad. It's about 50 to 75 miles away." Grower and grocer are partners, she says. The chain guarantees a fair, steady price that doesn't sink when the market is glutted and doesn't rocket when produce is sparse. In return, "We give the quality they expect when they expect it. We have to make sure Giant's program succeeds. If it doesn't attract extra customers. Where's the incentive for them to work with us? Because it's more expensive to deal with individual farmer, we have to give them a product so their sales go up." Mission accomplished, says Bob Hartman, fresh local buyer for Giant. "Traditionally, sales are soft in the summer. 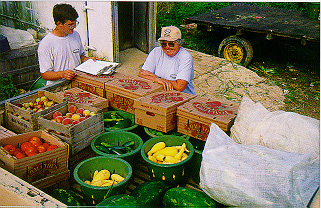 People are on vacation, they eat out......The first year we ran the local produce program, we noticed a very large increase in sales in summer. Last year, sales were darn near double the total of the year before." If you're interested in marketing to Giant, says Hartman, there are no complicated requirements or regulations. Getting your goods in its doors is simple. You've got to be close enough to truck your goods, and you have to grow what Giant needs. "We can only sell so many tomatoes and so much squash, and we have over 100 growers on our list at this time. But if someone has something in specific area that's not already being grown, I would potentially take them on," Hartman says. WORKING WITH SUPERMARKETS, says Phillips, means "You're going to have to be willing to package the material however the supermarket wants it packaged. Many farmers pack tomatoes in wooden baskets. Well, no supermarket is going to take them like that. They won't stack. You'll also have to see how the store wants your produce graded. For example, a tomato that's ready to put on a table will be mush at a supermarket. You want the tomatoes almost vine-ripened." When you know what the store wants, and it's agreed to try your produce, ship a satisfactory product. "You want that first shipment to look great. You want them to be "wowed.' You have to remember they're not a receptacle for your trash. You have to take losses when you're growing this stuff," Phillips says. If you send poor produce, she continues, "They're going to remember big time where it came from, You have to treat them right." To make sure their largest customer is satisfied, Jean and Russell pay attention to details and stay flexible. "We're willing to do a few little things that make things nicer for Giant. Tomatoes are extremely perishable, so we'll put 10 or 15 boxes of early breaker on the bottom of the pallet, with 15 breakers in the middle, and 15 ready to put on the shelf on top." That way, they know the ones on the bottom won't be rotten by the time the store gets to them, she explains. To ensure that corn doesn't get wind-and sunburned, the Phillips's bought a refrigerated box truck, "so corn picked cool in the morning is iced and gets to the store in much better shape than if it were on an open truck," says Jean. When Giant calls, the Phillips jump. "They have called us at six on Sunday morning requesting corn and we've had their order to them by 10." When they've not picking for or trucking to giant, the Phillips are marketing directly to customers at farmers' markets, their own roadside stands and wholesalers. Phillips says retail selling is a whole different world from shipping a raw product to a processor. "This isn't for everybody. There is a lot of aggravation with it. You have a lot of people demanding things and pushing and pulling you in different ways. "A lot of people don't have the patience to deal with that. They're interested in growing, and at the end they want to put it on a truck and be done with it. But vegetable sales just don't work that way. You have a lot of customer relationships you have to deal with. No matter how good your product is. you have to deal with customers saying 'I got a bad watermelon or corn with worms,' and you have to smile and give them their money back or give them another one even though you know it probably wasn't all that bad." You've got to find and court potential customer. Besides the obvious tactic of long-term advertising in the Yellow Pages and short-term advertising in the newspaper when the corn is ready, "We do a lot of things where we don't get a lot of monetary return, but they're good for the community and gain us publicity," Phillips says. "We give students at an elementary school a free hayride during their fund-raiser. They pay for insurance, so it just costs our time, but not real money. And it develops a good relationship with the community. A lot of times when you do that, parents say, 'They donated a hayride, we should go there and get our pumpkin.'" Once families are at her roadside stand, they find much more than vegetables to keep their attention. "We have animals for the kids to pet, a haystack to climb and a tunnel for them to crawl through. We find the kids say 'Come on, let's go to the Phillips' and play.' The parents feel guilty letting them play there without buying something. We usually close the home stand in September, but we leave the gate open with a sign saying 'Welcome. enjoy the animals.' On most afternoons there will be two or three kids running around. They have their parents well-trained." To cater to the older generation, the Phillips recently began selling produce at a retirement home. And they help the poor each year by letting a food bank work group called the Gleaners harvest produce that is okay to eat, but which is not the right size or shape for selling. "That ended up as a front-page story in the newspaper," says Phillips. We host a jousting tournament and the Montgomery County Ag Farm Day. We're listed in the Maryland Roadside Markets flier in the libraries and different places, and we're listed as a grower on the Montgomery County Farm Tour. This past year we gave away raw sweet corn samplers as well as coupons good for half-dozen ears of corn or a "spooky" pumpkin (a child-sized pumpkin) at our stand at the Montgomery County Agricultural Fair. We have had a lot of people coming into our pumpkin patch as a result of that."